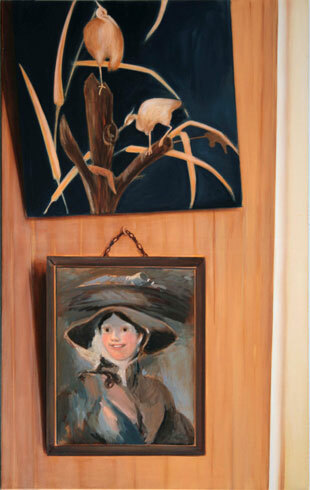 Paintings of interiors result from an act of trespassing on a private realm, the intimate sphere of the home. This genre enables the viewer to gain a sense-or a picture-of an absent individual whose personal environment suggests elements of their character. In a similar manner, private museums also allow the public to access the residences of people who are no longer living. While satisfying a sense of curiosity, this view within tends to encourage a process of piecing together clues about a person who has now become more familiar through the experience of their living space. While in Paris on a DAAD fellowship, Eva Weymann discovered the Musée Clemenceau, the home of the statesman, publisher, and art patron Georges Clemenceau. This residence has been preserved as it was at the time of his death, and even his slippers still sit under his bed. A close friend of Emile Zola, Claude Monet, and Auguste Rodin, Clemenceau is not an internationally well-known historic figure. (Thus, one's personal understanding of the individual is enabled by this unrestricted access-to fragmentary information-and the completeness of the living quarters. In a rejection of classical interior scenes, Weymann does not show the living space as a whole in her paintings. She provides no overview as to how furniture and objects are arranged. Instead, she moves through the room bit by bit, and her views almost seem like snapshots of specific moments and lighting situations. The ten works from the Intérieur/Clemenceau series portray cropped details that are seldom the focus of large-format paintings. The materials she singles out and their accompanying ambiance evoke a play of color and shadow. Emerging from the individual puzzle-pieces that Weymann presents is an atmospheric portrait, intimate but not voyeuristic, incisive but not unmasking. She thus creates a highly personal encounter with the realm of the private. Through the medium, the viewer is able to read not between the lines but between the pictures and develop an imaginary image of Clemenceau, who is alien to us as a person but suddenly familiar to us as a personality.